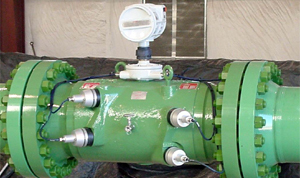 Ultrasonic meters are quickly becoming some of the most widely used meters in flow measurement. Currently ultrasonic meters are being utilized to measure natural gas, steam, air, water, liquid hydrocarbons, and various other fluids. Some of the major benefits of ultrasonic meters include the diagnostic capabilities, the fact that there is no obstruction to the flow stream, and the wide turndown capabilities of the meters. 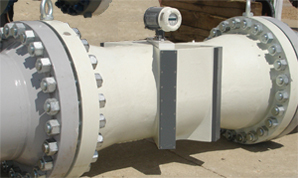 The CEESI Iowa Natural Gas flow facility has been testing ultrasonic meters since 1998. This facility mainly provides calibrations that are in compliance with AGA Report Number 9 (full list of industry standards), although other calibration services are available upon request. CEESI also offers calibration services at the Colorado Air flow facility. This facility generally services smaller meters and meters that are not meant for high pressure applications. CEESI ultrasonic meter calibrations are accredited by NVLAP (National Voluntary Laboratory Accreditation Program - Lab Code: 200377-0) and traceable through NIST (National Institute of Standards and Technology). Request a quote or contact us if you have questions about ultrasonic meter calibrations. Throughout the year, we offer several training courses and workshops that specifically address ultrasonic meters. Check out our list of events for flow courses that would be convenient for you or your organization. We have invested considerable resources into creating the Flow Measurement Technical Library so that could be a useful resource to the flow measurement community. There are free downloadable papers and abstracts from a variety of organizations relating to ultrasonic meters. This library contains over 68,000 documents from organizations including NIST, ISHM, AGA, ISFFM, ASGMT, FLOMEKO, MSC, AGMSC, WGMSC, ASME, NEL, and others. Search the Measurement Library for papers on ultrasonic meters.